Why Buy Ours? : Dearborn Deuce, Premier manufacturer of an all steel 1932 roadster body with a fully disappearing convertible top. Seventeen Reasons to consider purchasing a Dearborn Deuce Convertible™ body. As a potential buyer, you probably already realize that all other roadster bodies in our industry, either fiberglass or steel, are sold as “bare bodies”…that is, they do NOT come with all the equipment your body will actually need in order to be a completely outfitted body. This keeps the face value of their purchase price low, and it’s smart (but misleading) marketing. YOU will be responsible for outfitting those other bodies. A Dearborn Deuce Convertible™ body, however, comes fully equipped…and includes the priceless convenience of a hidden convertible top and power windows in a car you can completely close to the weather. It is dramatically different than anything else in our industry. If you are only interested in owning a body that is made out of steel, then you’ll be making this comparison to only two or three other steel roadster bodies. No other manufacturer that we know of offers you a fully outfitted body as its basic “standard” body. So you’ll have to factor-in all the other items you’re going to read about below, which we include…and which you are going to need….no matter whose body you buy. Your Dearborn Deuce Convertible™ body has everything already mounted to the body when you receive it; it does not arrive as a body with extra boxes of accessory parts that you have to fit and mount yourself. All the necessary pieces are fitted to the body at the time of assembly. There is no question that $24,500 is a lot of money for a hot rod body. Simply put, it’s a ground-breaking car and it’s expensive to manufacture. So, in order to justify a purchase like this, you must evaluate what you are receiving at this price level. There are many items to consider in the evaluation process…some of which are not as apparent as others. 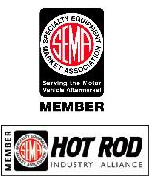 You must have access to all the information before you can make an informed comparison to “other” hot rod bodies. 1. The weight of one of our bodies is about 850 lbs., or, roughly double the weight of the other steel roadster bodies. It is a very sturdy assembly and because of this, they even ride nicer than a car with a lightweight body. They don't ride like buckboards. 2. Each body is constructed on a heavy-gauge steel base platform. All by itself, the body's substructure alone weighs just about the same as the complete steel roadster bodies offered by the other companies. This is the only Detroit-built roadster body in our industry, and it is assembled to OE production standards by the pro's at Oakley Industries. If you were to have an inner cage fabricated like the one inside our body, it would cost you several thousand dollars. That is what ours costs us to build. 3. A convertible top assembly of OEM quality is included with every body. Our top is manufactured for us by a major Detroit OE supplier of tops to global auto makers. So, the top on our car is constructed exactly the way any other OEM top is made, and it is covered with Haartz cloth, just like the rest. A glass rear window with a chromed inner and stainless outer frame is standard. Each top is completely pre-assembled on a precision fixture, tested, and then installed. You are paying for Detroit OEM quality. There is nothing else in our industry that is made like this top. 4. Each body comes with a fully polished, all-stainless windshield assembly, with the glass installed. Because the location of the windshield is critical, the holes are located with a special jig, and the windshield is mounted to the car for you during the assembly process. 5. All internal assembly work is done for you. Inside the doors, the window channel runs are installed, along with the power window motors and the side glass. The power windows are fully operable and ready-to-go when you receive your body; you just have to hook-up the power. 6. Two properly-calculated gas struts pop the trunk open when you pull a latch pre-mounted in the driver's side door post. 7. There are no seals for you to buy or make because our bodies include the convenience of having all the seals for the doors, windows, trunk, tonneau, windshield, and top as a part of the package. Our seal kit was developed especially for this car. 8. Each Dearborn Deuce body has an operating tonneau panel with the tonneau release latch pre-mounted for you, also in the driver's side door post. 9. To give our cowl an unprecedented degree of strength unlike that found in any other roadster body, a 1″x3″ boxed steel frame supports the entire cowl of the Dearborn Deuce Convertible. We also use a welded-in (and completely metal finished) dashboard that has its own welded supports that tie it directly into the main cowl frame. Thus, the dashboard serves as a structural member and ties the cowl together, providing added structural integrity to the entire cowl area. All this is to eliminate cowl shake typically found in roadster bodies. The windshield assembly on our car is bolted directly into the cowl sub-structure, and not just through the outer layer of sheet metal. Be sure to ask other body companies how they mount their windshields. 10. The base platform of any roadster body is its most important structural component. To give our body as much rigidity and internal strength as possible, the body starts life as a 1″x3″ boxed rectangular steel base-platform that is laid out much like a ladder. This base consists of two sub-rails that run the full length of the body from front to rear, just inside each rocker panel. They are tied together laterally in three places with 1″x3″ boxed rectangular steel cross-members, and this ladder-style sub-frame is then topped with a 1/8″ thick steel plate that is our floor; this is welded to the ladder frame (obviously, this is not a typical sheet metal floor). When fully completed, our substructure costs us several thousand dollars to manufacture, forming an entire structural skeleton to which the outer body panels are attached. 11. Precision assembly jigs position each outer body panel the same way onto our substructure every time. This is a closely controlled process, managed in a state-of-the-art automotive assembly environment, by Oakley Industries. Each one of our bodies is then subjected to a final quality checklist, and only after the body passes inspection is the convertible top installed, and the body moved out into to the staging area for release. 12. Our body panels are stamped at Oakley Industries. The quality of our stampings is the best OE quality available, both in precision, and in their repeatability. 13. Because of the quality of our stampings and the methods employed in its assembly, it takes only minimal hours to prepare and paint one of our bodies. Other bodies may require many weeks of preparation before they can be painted. Ours does not. Please keep something in mind: if you’re paying a body shop $50 per hour to paint your car, every week of “surfacing and prep time” increases the price you paid for that body by $2000 per week. If it takes your painter 4 weeks to prep it (and this is often the case), you just spent another $8,000 on a roadster body with no windows, windshield, top, or sub-frame. This is why, whenever possible, your body man should get a look at the body you are planning to buy. It is not uncommon to spend several weeks preparing a body, either steel or fiberglass. This is how a $10,000 body can quickly become a $20,000 body before it’s even in paint. Be sure to rub your hands over the panels on our car. 14. The convenience and comfort of having a convertible top and power windows when you need them is one of those things it’s hard to put a value on…what’s it worth to you? So, if you purchase someone else’s roadster body, you’ll have to consider the price of an add-on top…as well as the storage process of that top, and its ease of use. Removable tops seem okay…until you have to put one on in the rain, and then you realize they aren’t as easy or useful as you’re led to believe. Ours takes just about 15 seconds to put up… or down. 15. Resale value. Think about this a moment: there are literally hundreds of deuce roadsters for sale every year, and just as many are always being built, so there is always a relatively high inventory of roadsters out there to buy. As a result, roadster buyers can be extremely selective…it’s a buyer’s market. Open deuce roadsters are all basically the same car, so a Dearborn Deuce Convertible™ gives you a true edge in the resale market. 16. Most importantly you decide when and where you want to go, without having to watch the weather forecast over and over. By adding heat and air the hot rod season can start earlier and end later which gives you more time to do what we all love to do, DRIVE THEM!!! 17. If you take the time to work-up the costs of all the components you’ll have to purchase from other suppliers in order to duplicate what comes with our body, you’ll be left with a price spread that represents the real difference in price. Then ask some knowledgeable builders how long it takes to prep one of those other bodies, and factor-in the time for the body prep. What’s left is the convenience factor that comes with owning and driving one of these cars. Is a Dearborn Deuce body “worth” the remaining difference in cost to you?